Staving Artistamps is one of the sponsors this week for CPS Sketch 102. I enjoy playing in the CPS sketches weekly, and this week was no exception! 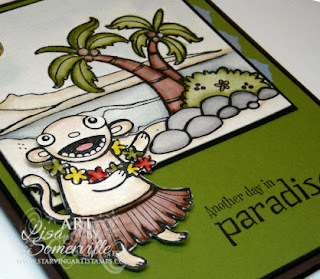 I did rotate my sketch to fit the needs of the DoodleFactory Tropics and Tropical Backdrop that I used. The images are stamped in Black on Watercolor paper then colored using the Marker Water Coloring Technique. I added some Spica Glitter to my images for a little shimmer. To create the scallop edging under my panel, I used the discarded piece after I punched my card stock with the Eyelet Border Punch - just another way to get creative edging! *Don't forget when you shop at Starving Artistamps, you can save 10% on all Starving Artistamps and DoodleFactory Stamps when you enter code savetenls. I hope you'll play along! 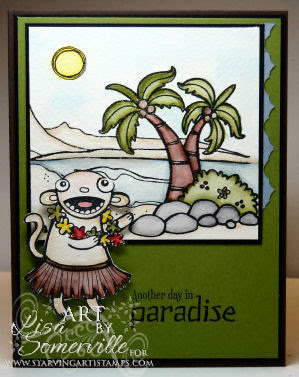 Be sure to stop the by Starving Artistamps Gallery Blog, you'll find links to the other Starving Artistamps Designers cards! Oh how cute are all of those images! Great coloring too and I love what you did with that CPS sketch.